Oxfordshire Cricket Board - News - Thame Town Clubhouse Completed! 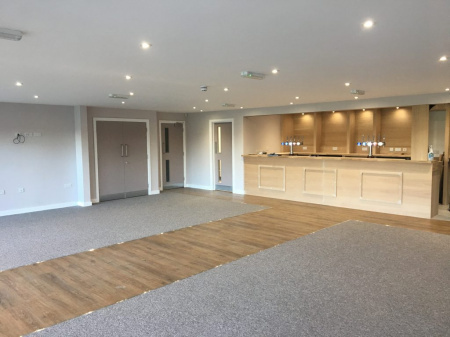 News » Thame Town Clubhouse Completed! Thame Town Cricket Club was handed over the keys to the new clubhouse! On Friday 26th October 2018, Thame Town Cricket Club was handed over the keys to the new clubhouse! A project several years in the making, construction started in the January of 2018 with Sports Clubhouses Ltd the main contractor. The Cricket Club worked closely with Thame Town Council to get the project underway, and would like to thank them for their support as well as all the volunteers, sponsors, fund-raisers and contributors. The new clubhouse meets ECB technical specification for Clubhouses and Pavilions, and is designed in a way that is sympathetic to its surroundings next to the Dove Cot and Church. The old clubhouse was built from an old barn in the 70s, by members and players. While it had lots of character and memories, it had reached the end of its usable life and no longer met the needs of over 200 playing members and 100 social members. There has been huge demand in Thame for Sports clubs and community facilities. And with an additional 750 homes being built in the Town over the next 5-10 years this will increase further. Oxfordshire Cricket were delighted to help Thame Town secure funding for this project, and offer support and guidance where needed. We are now very pleased that the club can boast a modern and welcoming facility to their growing membership.